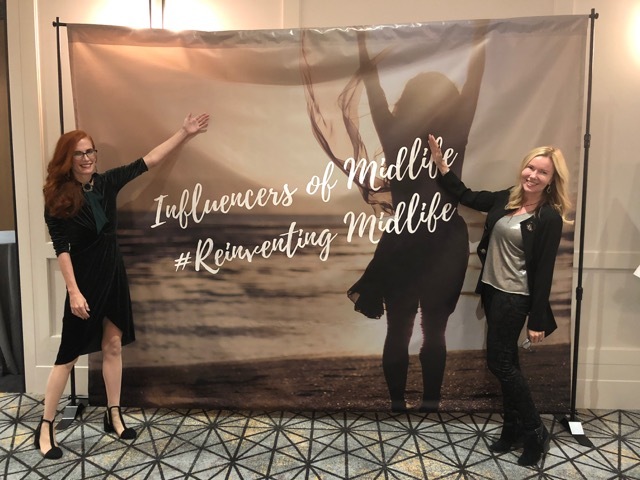 I was so thrilled to be able to go to the Influencers of Midlife Conference over the weekend, and I will be getting that post together soon. So, stay tuned! However, one of those wonderful ladies I met was Jessica, my contact through Soft Surroundings, and it was wonderful to talk and meet her in person and on a personal level. So, as a bit of a segway, I am wearing a very ultra soft grey toned leopard jacket, the Pasha Coat, from Soft Surroundings today, along with a beautiful, unique blue-grey leaf statement necklace also from the company. Met this special lady – Patricia, at the conference. So fun! Just a bit of a tidbit of info on the Midlife Conference, it was in Alpharetta, GA, in a posh hotel, a one-year-old hotel, called the Hotel at Avalon. Gorgeous! Hubby and I drove there, as it was just 4 hours from home, not that long of a trip. I was excited to meet with some of my blogger friends and ladies I have met on IG, that had an interest in learning those topics of midlife that we find important. My hubby would say, I could talk to a rock, as I think I have that gift of gab, and easy nature in talking to people. Robin Lamonte, and Nina Bandoni were our hosts, and they did a wonderful job of putting the weekend together. I loved meeting both of these ladies, and through their blogs, I felt like I knew them already. It was great as it was renewed energy for me, thinking about what I wanted to learn, and how I wanted to talk about certain topics on the blog, that women at midlife can relate. I am waiting on the pictures from the event, as we had a professional photographer come to the event, so you will see my post on socials when I have published and written the post. Please do stop by! I am excited to share about the weekend. As I mentioned, I met Jessica, whom I have been corresponding with now for over a year, and was so glad to meet this beautiful lady in person. We chatted about the blog, nails, our pups, Soft Surroundings clothes, just girls having a conversation, Jess then gave a talk on Saturday at the Soft Surroundings store on working with Brands and how bloggers work with Soft Surroundings. It was a great time as we asked questions and visited the store., enjoyed some peach belinis ( more on that later…) I need to sometimes get out of my “old-school” frame of mind, and remember to take more photos with ladies when I am at events, but I do enjoy living in the moment and the company! Where would I be without leopard?? Come on! You know you love it! I do. I think if leopard garments are made with wonderful fabrics and materials it is a timeless, classic print. What I loved about this coat, the Pasha coat from Soft Surroundings, is that is has a softness level of 3, which means “ultimate softness”. Yes, please! It is like wrapping yourself up in your favorite throw or blanket and wearing it as a coat. I love it! I am wearing it in an XS, which is a consistent size for me at Soft Surroundings. I also loved the fact that this coat is more snow leopard, with grey tones as opposed to the traditional tan/black/brown combination of colors. This is also neutral and lends itself both to color and other wonderful neutral tones. At first, I was going to wear my black AG denim jeans with this outfit, when I thought of wearing those LOFT white skinny jeans. It’s wonderful to pair white in the winter, as there are no rules! 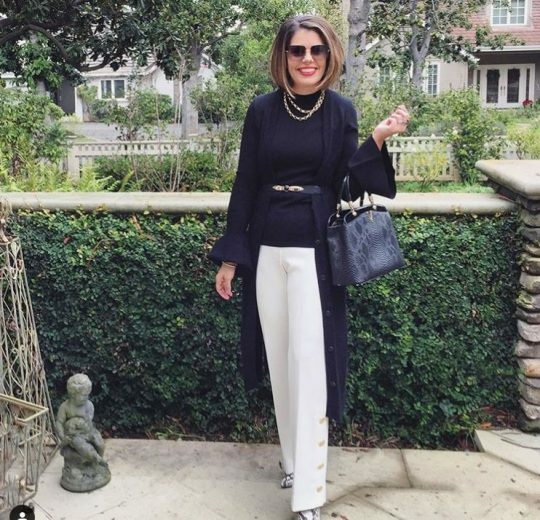 ( at least ones I follow) The white adds more of a “Pop” and really contrasts with the grey cashmere Ann Taylor sweater and the faux fur leopard coat. So choose those white jeans for something different in the winter! I am wearing the Modern Skinny jeans style in my usual size, a 4. I did get the tall, as I need at least a 32 inseam, and it has a 33. The necklace caught my eye straight away when it was offered on the Soft Surrounding’s site. 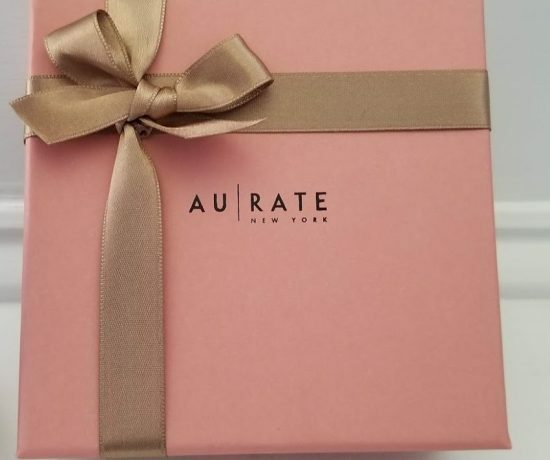 If you are nearby in Alpharetta, GA the store does have the necklace, however, it has sold out online. I do love several other necklaces that would add nice color contrast to this neutral look. Here, This Roccia Necklace in blue and earthy tones is sp pretty My leaf necklace is made from paper and it is very light! Coated in a steel blue/grey color I styled it with a darker grey sweater as I love the mix of the two colors. My Jambu boots were what I decided upon, as they have silver and grey detail on the side of the black leather boot. A vintage pair of baby blue earrings adds to the color scheme. Even my nails are a light grey and I got them powder dipped.. but that is another post. Soft Surroundings has now added their Pre-Spring Arrivals too. so, the cold will end!! **c/o thank you to Soft Surroundings for sending me this beautiful coat and necklace. * this post is written by me and my thoughts and opinions are truthful. affiliate links. I have provided some shopping links for you, the blog earns a small commission each purchase you make at no cost to you. LETS PARTY! 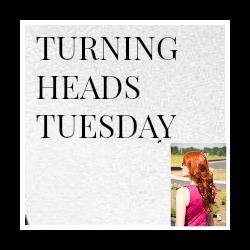 SO, ITS COLD OUTSIDE, YOU ARE HAVING A CUP O JOE,.. LET’S GET TO THE TURNING HEADS TUESDAY LINKUP. PLEASE LINKUP AS MANY POSTS AS YOU LIKE BY CLICKING ON THE INLINKZ BLUE BUTTON AT THE BOTTOM AND COPYING YOUR URL. READ ABOUT THE LINKUP HERE. PLEASE LEAVE A COMMENT ON AT LEAST 3 BLOG POSTS! THANK YOU! That gray sweater and your necklace look amazing paired together! Oh boy that sweater looks warm and cozy too, and very flattering! Sounds like it was a super fun time and a great outfit to go along with it. I’m hoping to see some of my blogger friends tonight! I’m loving that coat, girlfriend! Gorgeous! Jess, I absolutely love, love, love this outfit! Everything at Soft Surroundings is amazing. And I am so looking forward to your upcoming post on the Atlanta conference. That’s lovely you got to meet a fellow friend from online, I love that! Really liking your leopard coat too, very chic! What a beautiful coat! It looks great with the white jeans! So fun to read a little about the conference you attended and I am looking forward to the full post! 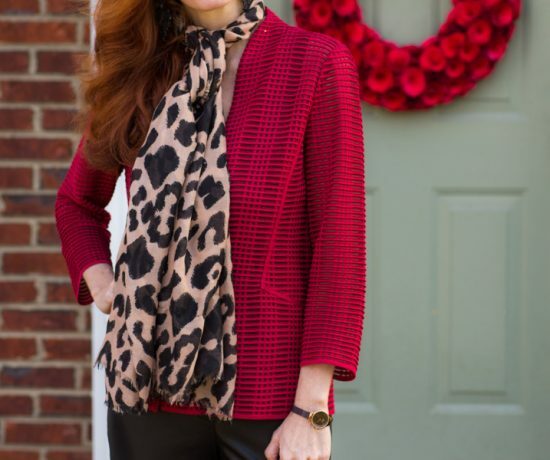 You look great in this fabulous leopard coat and cool necklace from Soft Surroundings. So nice you were able to meet your contact in person! Great event, Jess. The fur coat looks great. Lovely look. Gorgeous furry coat! Your necklace is so pretty, it looks lovely over the grey sweater! I’ve been looking for a grey toned leopard coat! Somehow I missed this one in the store; I certainly would have asked them if my size was available! A cozy coat would be just right with the cold we are having. It was great to meet you this weekend… Glad you had a safe trip home! I wanted to attend the conference in GA but it just wasn’t feasible this time around. I can’t wait to hear all about it though. Now onto your outfit, your coat is beautiful Jess and I agree! I love the colors. It’s more subtle than the brown and black combo yet still so stunning. That necklace is fab on you Jess! And so fun getting to meet up at the conference! Oh gosh, what a beautiful coat! I’ve been wanting a leopard coat for awhile. I worked with Soft Surroundings once and loved it, hope to work together with them again someday. They’re actually located in my city (St. Louis). It is so nice to meet someone face to face. I also noticed you’re wearing white denim with them, such a great choice. I keep forgetting about my white denim, I think I wore them last in the late Fall! That fab necklace really caught my eye. Very unique. Can’t wait to see more photos from the weekend. What a wonderful experience (and lovely outfit!). I haven’t found any events like that in Spain but I’d love to attend one. That coat is so pretty! You look cozy and warm while staying fashionable! I would have loved to have attended the conference, you are so lucky to have been able to go – hosted by 2 of my favorite ladies! 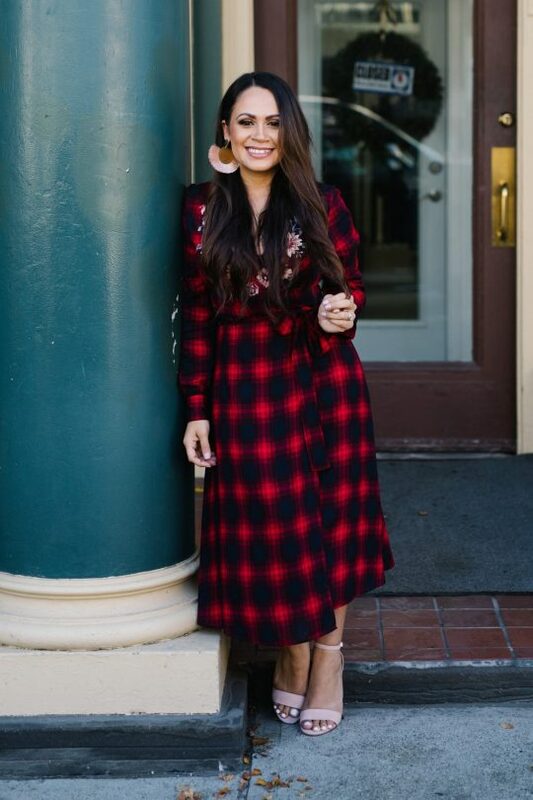 I love the dress you wore to the conference as well, it’s so pretty on you and the shoes are a perfect pairing! Thank you for sharing my photo from last week, that was an outfit favorite of mine, so I am happy the ladies liked it! What a fun meet-up! It’s always great to meet other blogger friends that we normally only know virtually. I love this fun leopard coat, looks great on you. Can’t wait to hear more about the conference you attended. This coat is gorgeous and looks so cozy! I’m so glad you had a good time and am looking forward to your professional photos! Can you tell me, how are the white jeans on sizing. I would normally get a size 12/31. Would that be accurate with these? Thanks, Jess. Thank you Kim! I look forward to seeing the photos and posting. I wear my usual size with the modern skinny jeans from Loft in white. I wear a 4, but had to get the tall, as the tall has a 33 inseam. The LOfFT jeans in this style, would work for you, but the inseam is only 30″ in regular length. Love this outfit and your pretty coat!! Such a gorgeous coat and necklace! I love all of these pieces and the necklace is the perfect accessory! I think the white jeans are so great for this time of the year and especially with leopard! I also know what you mean about taking pictures at events! I start talking and forget all about it! Have a nice day Jess! I know what you mean about enjoying the moment vs taking photos. I used to be all about the photos, but I’m trying to really be in the moment now more!! It’s a hard balance. As for that coat…it’s a stunner Jess. So you, and so perfect! This coat looks so cozy and chic, Jess! Love how you thought outside of the box and wore yours with white denim. I may have to try that with mine! Your coat is fabulous! Looks so good with the white denim! Jess, I love the coat. I love the outfit. And that necklace is absolutely stunning! It looks like you had an amazing time at the conference! I only wish I could have joined you all! Oh that coat – so beautiful! Love the way you styled it with the white denim. That necklace is so pretty too. I wish we had a Soft Surroundings here – I’d love to check it out. Sounds like the conference was exceptional and I am so glad you were able to go. Can’t wait to see the pictures! Love the white jeans with the leopard coat Jess. That’s so cool that you were able to attend Robin’s conference! I will look forward to hearing more about your conference. The snow leopard coat looks so good on you and the white jeans are a perfect choice. Many thanks for hosting. What a fabulous meeting! That necklace is fantastic and the one you link too is also very attractive! And the coat is amazing, looks very good on you!